Rich Brownie Taste with a Cookie Crunch! A Chocolate Indulgence You Can Feel Good About. It all began when Sheila G, a passionate chocolate-loving baker, took a treasured family recipe for fudge brownies and baked her way into a thriving business. You may have tasted one of her rich, dense squares of heaven at some of our nation's finest restaurants and theme parks. Like many brownie aficionados, Sheila is particularly fond of the crispy edges. In fact, she took great joy in walking through the bakery, gathering the brittle batter off the sides of the sheet pans as the brownies cooled in their racks. 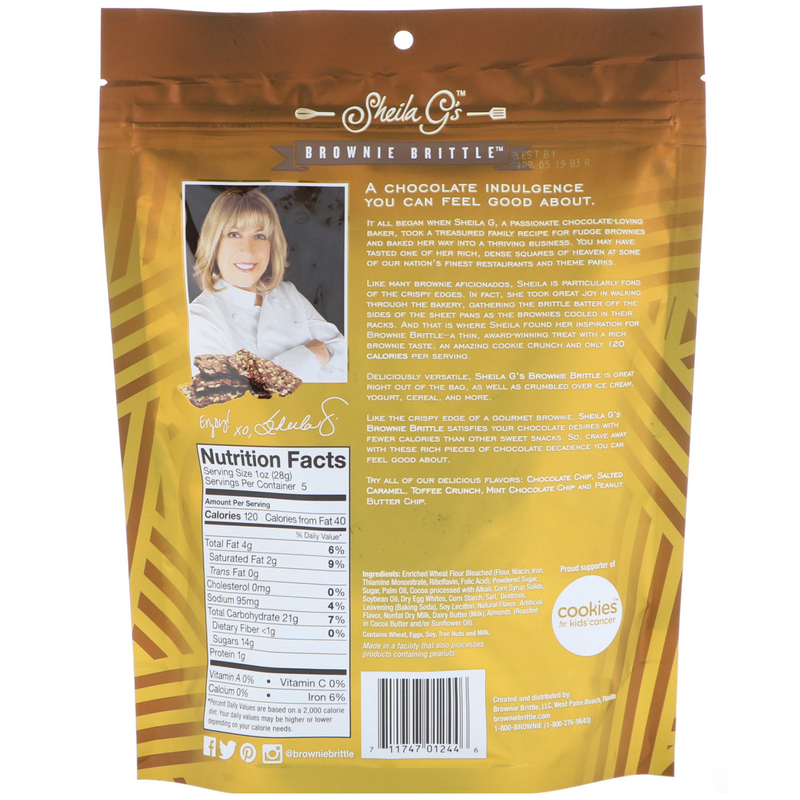 And that is where Sheila found her inspiration for brownie brittle- a thin, award-winning treat with a rich brownie taste, an amazing cookie crunch and only 120 calories per serving. 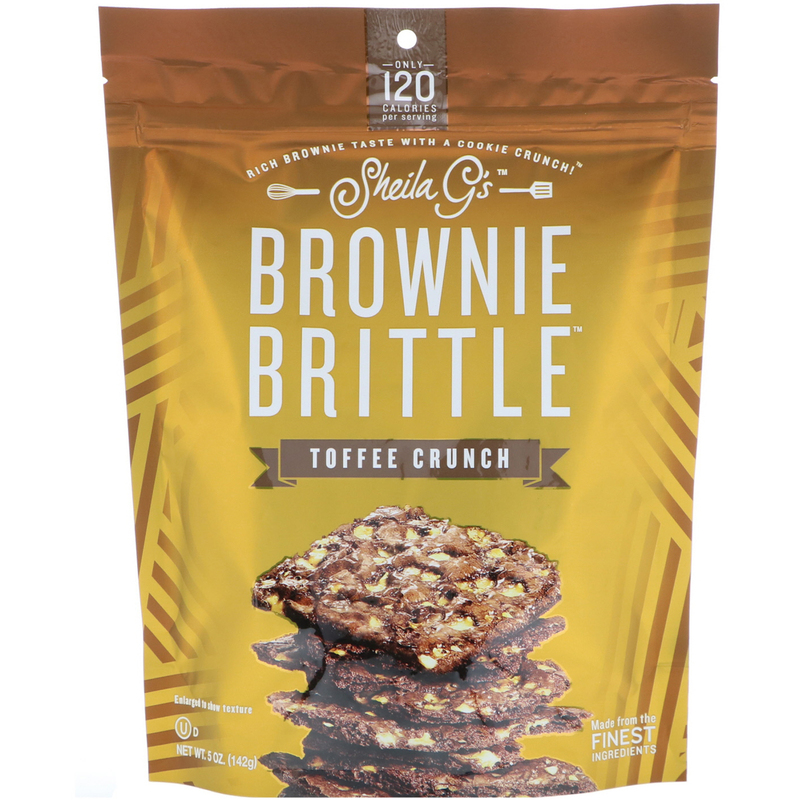 Like the crispy edge of a gourmet brownie, Sheila G's Brownie Brittle satisfies your chocolate desires with fewer calories than other sweet snacks. So, crave away with these rich pieces of chocolate decadence you can feel good about. Deliciously versatile, Sheila G's Brownie Brittle is great right out of the bag, as well as crumbled over ice cream, yogurt, cereal, and more. Enriched wheat flour bleached (flour, niacin, iron, thiamine mononitrate, riboflavin, folic acid), powdered sugar, sugar, palm oil, cocoa processed with alkali, corn syrup solids, soybean oil, dry egg whites, corn starch, salt, dextrose, leavening (baking soda), soy lecithin, natural flavor, artificial flavor, nonfat dry milk, dairy butter (milk), almonds (roasted in cocoa butter and/or sunflower oil). Contains wheat, eggs, soy, tree nuts, and milk. Made in a facility that also processes products containing peanuts.